Are Alden and Maine part of Enteng Kabisote 10? Are Alden Richards and Maine Mendoza part of Enteng Kabisote 10? 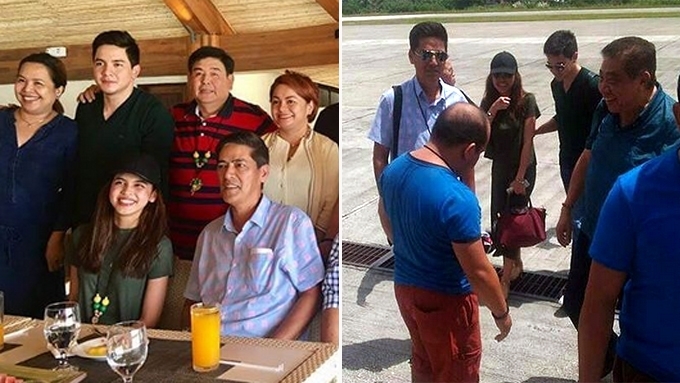 Alden Richards and Maine Mendoza were seen arriving in Bohol with Vic Sotto and the Enteng Kabisote 10 and the Abangers staff. Does this mean that they are a part of the movie? The AlDub love team of Alden Richards and Maine Mendoza will be part of the tenth installment of Enteng Kabisote. In photos uploaded by Vic Sotto's Instagram fan account @bossingvicsotto, it was seen that Vic arrived with the Enteng Kabisote 10 and the Abangers staff along with Alden and Maine in Bohol yesterday, October 6. The first photo was captioned: "Aldub and Bossing just landed in Bohol for a shoot cto"
Another picture was uploaded with Vic riding a bus with AlDub and the staff of Enteng Kabisote. It can be recalled that the tenth Enteng Kabisote had its story conference last August 11. The announced cast members included the JoWaPao trio (Jose Manalo, Wally Bayola, Paolo Ballesteros), Bea Binene, and Ken Chan among others. Last month, the team has already started shooting for the movie which producers are planning to submit for consideration to the 2016 Metro Manila Film Festival. According to GMA News, Alden and Maine will be part of Enteng Kabisote 10 and the Abangers. Through an Instagram post by lavendersunset312, it was revealed that the cast of Enteng Kabisote 10 will be shooting in Bohol for the next few days. The post (which uses a photo by Leah Marchil) also disclosed: "The whole team led by Director Tony Y. Reyes with Vic Sotto, Alden Richards, and Maine Mendoza met with Gov. Edgar Chatto today. According to Director Tony [Reyes], Bohol is their only pick as the perfect location for the plot of the movie franchise. They will be featuring Bohol's famous scenic spots in the movie and will be documenting even more attractions too."